While recently reading Dorothy Young's booklet about her time with the Houdini Show, I stumbled upon a name that did not ring a bell. 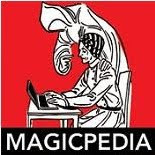 In fact, when I looked him up in the Silverman book and the Kalush book on Houdini, neither of them mention this person. I eventually found a small mention of him in Houdini The Untold Story by Milbourne Christopher. Then another mention in Pat Culliton's great book Houdini: The Key. In fact, it was a piece in Pat's book that tipped off another bit of info that I'll cover here too. The man's name is L. Lawrence Weber. He was born in 1869 in NYC, New York. According to Wikipedia he was an American Sports Promoter, stage show producer, and theater manager. In 1915, he was involved in the founding of Metro Pictures, which years later would morph into Metro-Goldwyn-Mayer. 1925, he went into a partnership with Houdini. Weber would be the producer/promoter for the BIG 3-1 Show. The Christopher book mentions that Houdini was in meetings with Weber almost daily. They had a tour to figure out, new promotional materials to design and approve, and a show to put together, a very big show. 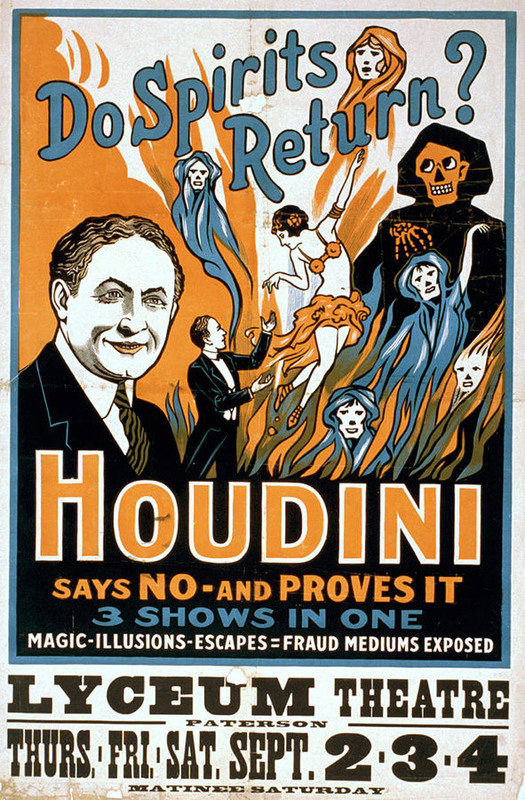 The new Houdini theatre show, sometimes known as the 3 Shows in One Show, opened August 1925 at the Maryland Theatre. In The Untold Story, Milbourne Christopher says the show opened at the Maryland Theatre in Baltimore. This had me very excited. I was able to track down the location of that theatre and some photos. Unfortunately, The Maryland Theatre in Baltimore is long gone. AND, it turns out it's also the incorrect theatre! Christopher got that part wrong. I knew there was a Maryland Theatre in Hagerstown MD, and that one still stands. However, after much digging I found the Hagerstown Maryland Theatre was also not the location. Thanks to something printed in Pat Culliton's book Houdini: The Key on page 398 there is a review of the very first Houdini 3-1 show. In the article it mentions Cumberland Maryland. After, more digging I finally found where there had once been a Maryland Theatre in Cumberland. It was on 37 Mechanic St. in Cumberland. The Cumberland Maryland Theatre opened on Nov 21, 1907 and had 1800 seats. It is now long gone, it was razed in 1964. In the article printed in Houdini: The Key it says, "Opening the show last night, Houdini referred to Cumberland as marking an important epoch in his life and said that if he ever wrote an autobiography of his life, he would devote a chapter to his experiences in Cumberland inaugurating a new phase of his career as a public entertainer." In the same article on page 398, it goes on to say, that L. Lawrence Weber sent a note to Houdini following his opening at the Maryland Theatre which read, "Hope that today in Cumberland was but the dawn of a long and happy partnership between us and that future years will bring you new and greater honors which you so honestly deserve." 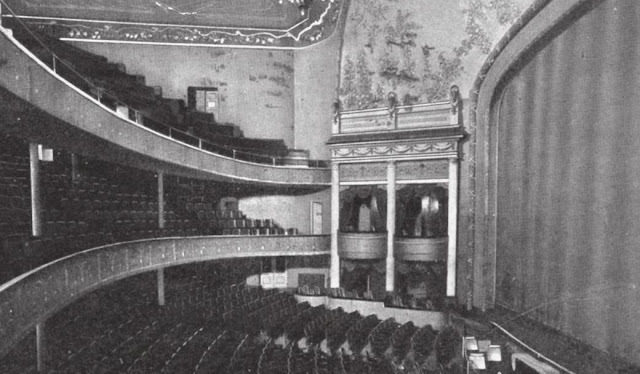 Here is an image of the theatre where Houdini began his big touring show in August 1925! Houdini's big time theatrical debut took place right there on that stage. 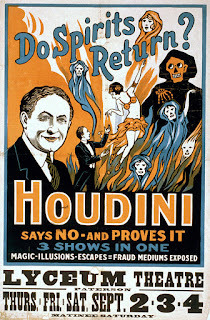 No more Vaudeville for Houdini. Getting back to L. Lawrence Weber. He had a very successful career producing plays. His last was The Man Who Killed Lincoln which ran in 1940. Mr. Weber had one other connection to Houdini. He was one of the Honorary Pallbearers at Houdini's funeral. 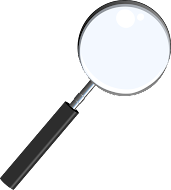 The others included: E.F. Albee, J.J. Murdock, Martin Beck, William Morris, Lee Shubert, Mark A. Luescher, Charles Dillingham, Richard E. Enright, Adolph S. Ochs, William Johnson, Adolph Zukor, Orson Munn, Arthur Prince, Bernard M.L. Ernst, Professor Brandon Matthews, Joseph F. Rinn, Sophie Irene Loeb, Bernard Gimbel, Francis Werner and Oscar Teale. *Please check out the comments below as John Cox/WildaboutHoudini.com had found out some information on L. Lawrence Weber that I missed. It adds another dimension into the Houdini/Weber relationship! You should include my blog next time you make a info sweep. I talk a bit about Weber in my post on Houdini's 3 Shows in One, and also did a post about a remarkable letter of complaint that HH sent Weber when he discovered a clause in his contract which actually might have played a part in his death: Houdini threatened to cancel his 1926 tour after Detroit. You'll also notice "L. Lawrence Weber presents" on all those large Houdini sidewalk standees now in DC and Arthur Moses collections. That was when I first looked into Weber. Like you, I wondered why I hadn't heard that name before. Surprised he's not mentioned in Silverman. But Kalush barely even mentions the full evening show! I didn't know about Weber's movie background. That's interesting. And good job finding that theater! You know what, I did go to your blog, and checked the Blog Index and there was no listing for L. Lawrence Weber. I wish I had dug deeper, but I got side-tracked trying to find a photo of Weber and trying to find where this Maryland Theatre was. I never did find a photo of Weber. That's what I get for working on the blog in the late late late evening. For the record though, I always go to your blog. It's usually the first place I go to make sure you haven't already covered something, or covered it the same way I was going to. In this instance I'm sorry I missed those two pieces, especially the later one. Thank you for including the links in your comment! You did a great job Dean! I was under the impression that HH opened his 3 in 1 on Broadway, New York and not Cumberland, Maryland. In fact, that would have been my last guess as to the first presentation of 3 in 1. From reading Silverman, you would think the show opened right near Times Square. The Cumberland Maryland Theatre looks about as classic as theatres get. It looks like a mini Hippodrome.